Egypt is one of the most alluring of all Middle Eastern countries. A hotbed of political turmoil, economic flux, and archaeological treasures, it has turned from a country into a field of study in its own right. Scholars have been pursuing Egyptology for centuries and the fact that it remains a target of interest in modern academia just goes to show that there is so much left uncovered. Students interested in studying in Egypt have scholarship opportunities ranging from the federally funded to those at private college and university programs. While some of these programs are extremely competitive as the field of study here is specific to one country, they make up for it by generously offering significant scholarships or even full tuition. Start exploring your options in Egyptology below. David L. Boren Undergraduate Scholarships are well designed for undergraduate students studying in a critical needs international program, such as Egypt and the Middle East. Eligible students must be engaged in a program of study that enables them to not only learn the formal language—Arabic—but the vernacular, or everyday colloquialisms or common language inherent in any linguistics system. Students must also be able to become very familiar with the country’s culture and norms. Applicants must have impeccable academic records and a financial need for the funding. Boren Graduate Fellowships require the same program criteria and the same arrangement of service for scholarship. These awards provide up to $30,000 for two years of study to those students who display the highest achievement and potential to meet the needs of their chosen study in Egypt. The National Flagship Language Program is designed solely to get a student up to speed with a critical needs language, such as Arabic, by immersing them in the country, its language and culture. 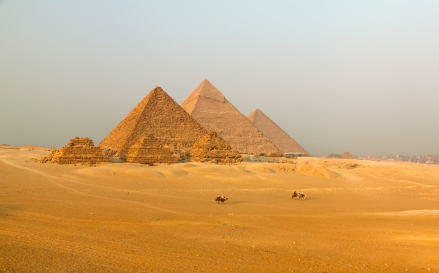 Students may engage in language studies in Egypt and qualify for the full-tuition funding. The NSEP is careful to match linguistically and culturally well-suited and eager students with the needs of progress in the study of the Egyptian languages. The School for International Training (SIT), a leading study abroad organization who gives away $750,000 a year in award funding, offers the Middle East and Islamic Studies Scholarship. Students pursuing a program of study in Egypt qualify for consideration. Selections are made on the basis of academic merit and a demonstrated financial need. SIT scholarship awards may be any amount up to $5,000 depending on funding, number of students awarded and each candidate’s financial need. Every student interested in the pursuit of Egyptian studies should be aware of the renowned Simpson Scholarships in Egyptology, which cover studies in culture and history of the country from antiquity up to the present. This highly selective scholarship is ideal for the student interested in Egypt as a whole picture, complete with its centuries of unique and fascinating history. The Simpsons are funded by the American University in Cairo and are open for application to junior or senior undergraduate students at most U.S. colleges and universities studying a program in Egyptology. Awards are very competitive and students are selected for academic excellence as well as financial need. Awards are $2,500 per semester, and up to $5,000 for a single year. Students accepted into the American University in Cairo’s study abroad program are eligible to apply for the Herman E. Eilts international scholarship. Applicants are required to write an essay answering the question, “How will my experience at The American University in Cairo impact my future career plans and broaden my appreciation of Arab culture?” The paper must be a minimum of 1500 words. The scholarship is directed towards American undergraduates who have a desire to pursue Middle Eastern studies or Arabic studies at the University for up to one year. Students receiving the scholarship must maintain a 3.5 GPA minimum. Contact the American University in Cairo for more information on how to apply. Besides these scholarships, many colleges and universities offer a changing menu of abroad study programs that do occasionally include destinations generally considered exotic such as Egypt. Nearly all private college study abroad programs, due to their significant expense associated with traveling overseas, include some kind of financial aid package. Every institution provides its own brand of funding, from full and partial abroad tuition to travel expenses only, so check with the study abroad office of your school for the most specific information to Egypt.